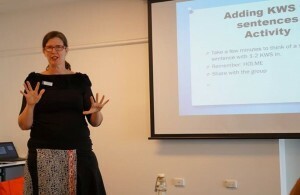 Michelle is an Auslan Accredited Interpreter who has extensive experience working in the Education and Disability sectors for almost 20 years. Michelle has worked throughout the state of Western Australia, with many years residing in the North West of Australia. Michelle has worked with people of all ages, cultures and backgrounds with complex communication needs; Profoundly Deaf, Otitis Media, Fetal Alcohol Spectrum Disorder, Autism to name a few. Michelle is a passionate presenter who delivers her courses and workshops in a professional and interactive manner. Participants are encouraged to leave their inhibitions at the door, this way you are guaranteed to enjoy yourself. Michelle works closely with participants, in the capacity of workshop presenter, consultant and mentor to continually support you both at the workshop and into the future. Michelle looks forward to meeting and working with you and your team in providing quality, customised, affordable courses, workshops and customised programs. With Michelle’s ongoing expertise and support, you will feel confident to learn, improve and maintain your Auslan and Key Word signing skills.